Australia is seeing a steady growth in the solar market. The latest figures released by Sustainable Energy Association of Australia (SEA) shows that more than 750,000 homes now feature solar photovoltaic panels. This brings total capacity, on home rooftops, to about 1.67 gigawatts(GW). The rate of installation slowed from 2011 after most states wound up their FIT schemes, but current trends shows that 600 MW is set to be added in 2012. In the next 12 months, Australia is forecasted to add another million houses with solar PV installed on their rooftops, with a capacity of over 2.3 GW. The State of Queensland remains the biggest in terms of installed capacity with 475 MW (see Table 1 below), followed by New South Wales with 435 MW. Queensland was one of the last states to wind back its FIT tariff, but gave installers and households approximately 12 months for a less troublesome transition to the new system. Table 1: Numbers and installed capacity of solar, as at June 2012. The average system sizes recorded in June 2012 are around 2.84 kW and are expected to grow. Back home, we have the FIT tariff and incentive by SEDA Malaysia that targets around 2,000 houseowners in solar power investment this year, and 10,000 in 2013, which could earn them an average of RM500 monthly for 21 consecutive years. Of course this figure is a dwarf compared to Australia's three quarters of a million houses. 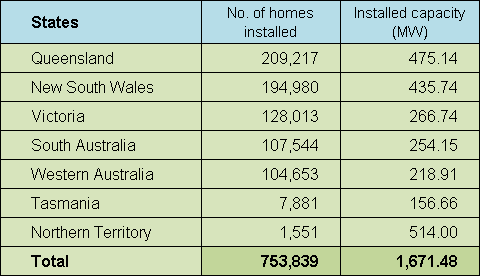 Australia's population as at December 2011 is around 22.6 million (ABS) with 1 million houses installed with solar PV this year. In comparison, our total population is around 28.6 million (Dec 2011) with probably less than 2,000 houses with solar PV. The climate and geographical location of Malaysia is better suited for solar power industry compared to a slightly temperate country like Australia, and lesser sun-radiated country like Germany. We are very much at infancy stage but with the right approach, there is no stopping us from achieving similar ratio as that of Australia's. Very soon, for every 22 houses in Australia, there will be at least 1 with solar PV installed on its rooftop. Do yo think you can see a solar PV system on a single rooftop in a 200-house housing estate anywhere in Malaysia? Take a walk sometime and observe.